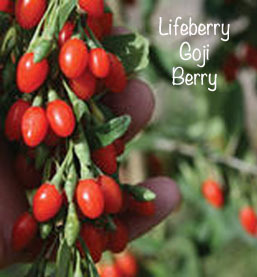 Goji Berry 'Big Lifeberry' Plants are easy to grow and almost maintenance free once established. You can grow your Big Lifeberry Goji Berry plants in your vegetable garden or in containers on your patio. Lycium barbarum (Goji) will tolerate some drought once established but as with most fruiting plants, it is suggested that you water it regularly. Stress from drought may inhibit the flowering and fruiting of your Goji plant. Plant in well drained gardens or containers. Stake the strongest canes of your Goji Berry Plant for ease in harvesting. You can space plants approximately 7 feet apart as they can spread 5 to 7 feet. Pruning lateral branches lightly will make the plant easier to manage and encourage new growth which is good as Goji blooms on new wood. Plant your Berry Plant in full sun though it will tolerate some light shade. Goji berries attract birds, deer and raccoons, so you may want to protect them by putting bird netting around it or using vegetable safe topical repellents. Goji berries plant is a sprawling shrub with long, flexible canes and clusters of small, grey-green leaves. The flowers are a brilliant royal purple and they appear in late spring/early summer along the length of the canes. They give way to juicy, bright red fruits that resemble small peppers. They grow sweeter as they mature on the plant. Goji plants continue to flower and produce fruit through the first heavy frost. Fertilize in early spring after new growth begins with a fertilize blend for woody plants such as a rose fertilizer. According to webmd.com, goji berries have compounds that are rich in vitamin A and may have anti-aging benefits, which will help to boost your immune function, help vision and may even help prevent heart disease. Some research suggests that goji berry extracts may boost brain health and may protect against age-related diseases such as Alzheimer's. Other studies using goji berry juice founds benefits in mental well-being, and calmness, athletic performance, happiness, quality of sleep, and feelings of good health. Read the complete article on webmd.com to see if the berries are right for you. 'Big Lifeberry' Goji Berry Plants ship in 1 quart containers. Please note: we cannot ship this plant into California or Arizona.